When you're in the business of taking great pictures, the set is everything. This 1963 Airstream Overlander offers a platform unlike any other — it houses traveling photobooth company Rose & Dale Photo Co. Inside, the mobile studio features weathered light oak floors, iconic interior aluminum skins and recessed dimmer lighting. 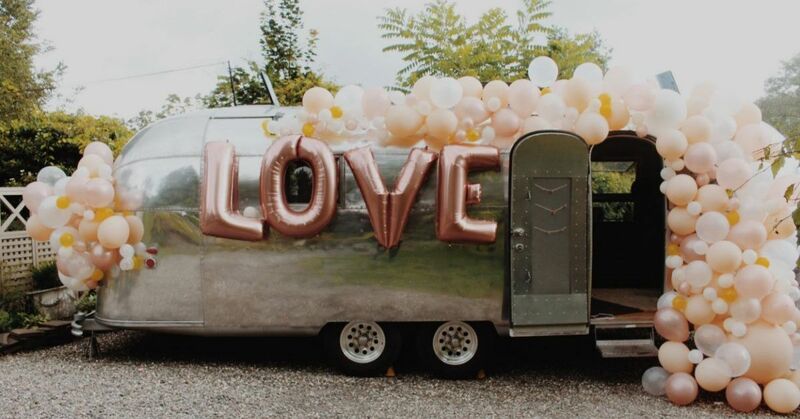 From its polished exterior to the immaculate space within, the Airstream is the perfect photobooth host for weddings, festivals and private parties. Along with boasting unique booth space, the ipstate New York–based company creates customized backdrops, decor, balloon installations and props. The interior of the Airstream features an aluminum skin that gives the space a reflective glow for photos. In front of the back window, Rose & Dale Photo Co. created a staging area that can include anything from vintage furniture to custom backdrops. An antique green leather chair finds its complement in layered rugs, a Moroccan ottoman and lots of greenery for a traveled aesthetic. A vintage velvet tufted chair instantly changes up the look of the space. The company can also swap items like books, plants and picture frames on the back windowsill for a custom look. One eye-catching transformation is a converted record player found for $50 that was gutted and painted for a unique decor addition. It can also double as a bar. When Rose & Dale Photo Co. is between events and on the road, the Airstream stores all of the furniture pieces. A rattan and cane settee offers an island vibe when paired with palm leaf pillows and a tropical plant. With light shining into the back window, the aluminum siding is especially aglow. To give clients more of a traditional photobooth experience, custom backdrops hang over the window space. The interior of the Airstream isn't the only part that gets a makeover for custom events. This balloon installation sets the bright and cheery tone from the outside in. Share this sensational Airstream photobooth on Facebook. Resources Rose & Dale Photo Co.